When someone first uttered the phrase “go big or go home” back in the 1990s, the Butcher Block from Boucherie is what they had in mind. This gargantuan menu item is enough to feed 5 Fred Flintstones. What you see before you is Boucherie’s large format, signature dish. The Butcher’s Block includes a house selection of sauces and dry-aged meat; 16 oz filet mignon, 14 oz hanger steak & 16 oz bone in New York strip … plus bone marrow. This was a succulent, mouth-watering display of humankind’s dominance over the planet. You need this. You need this now. Call up your friends, co-workers, lover, family … whomever and make a plan to go enjoy a decadently delicious night of Steak of Boucherie. 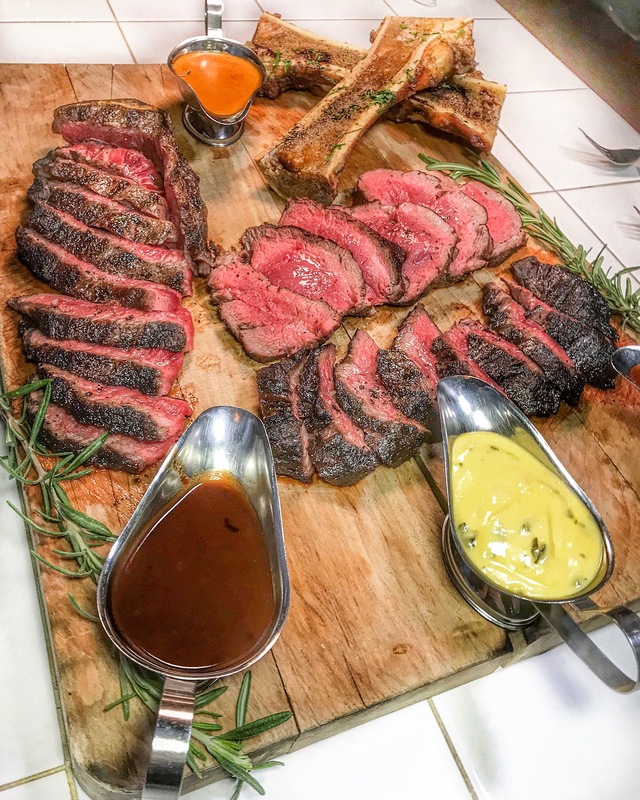 This entry was posted in New York, Steak and tagged "steak club 7", bone marrow, boucherie, nyc, rev ciancio, steak, steakclub7, the butcher block. Bookmark the permalink.